Your fave stars gathered at the Microsoft Theater in Los Angeles to celebrate another year of music at the American Music Awards. The hairstyles ranged from center-parted sleek and straight locks to poofy bouffant-esque designs, with some stars even sporting simple pulled-back ponytails. Here’s a round up of our fave American Music Awards hairstyles that truly topped the charts! 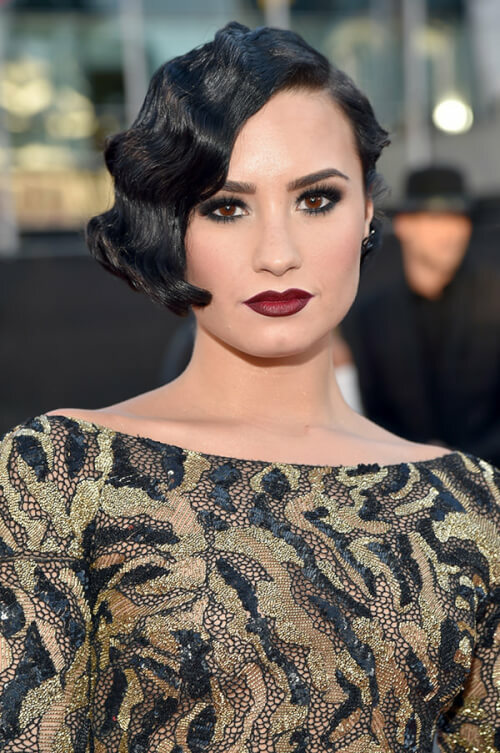 Demi Lovato rocked a super glam look with her gorgeous raven finger waves. 1. Prep clean, damp hair with a lightweight volumizing mousse. 2. Create a side parting and blow dry using a large barrel round brush. 3. A simple way to create finger waves on dry hair is to use a three-barrel waver and secure waves as you work with finger wave clamps. Try Kevin Murphy SHIMMER.SHINE for a high shine finish. Kendall Jenner took it to the next level with this straight-up top knot that defied gravity. 1. Prep damp hair with a lightweight leave-in spray. 2. Blow dry with a paddle brush for a low volume style. 3. Section off fringe and gather remaining hair into a high ponytail at the crown. Twist hair around to create a top knot, then make it stand up by pushing it up and forward, securing with bobby pins. 4. Brush fringe downward in piecey fashion. Leave some strands loose around the face for softness. Ellie Goulding looked effortlessly cool with a blend of contrasting volume and sleek ends. 1. Prep damp hair with a lightweight thermal protectant. 2. Blow dry with a paddle brush for a low volume hairstyle. 3. Backcomb base of hair at the crown area only. Take the fringe area and spritz with texturizing spray. Sweep fringe strands over the backcombed crown area with light separation. 4. Sleek the sides down and back behind the ears. Try Kevin Murphy TEXTURE.MASTER for massive volume with great hold. We hope you are inspired by our favorite American Music Awards hairstyles. Which beauty wore it best?